I got my guitar yesterday ! My friends are very interested in her. I will introduce her to my guiter friends tomorrow. They say a thing of beauty is a joy forever. 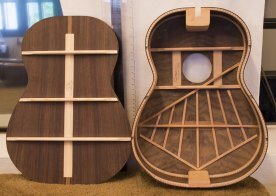 I just wanted to tell you how beautiful my friend Jimmy's flamenco Primavera with lattice bracing turned out . Also it sounds outstanding it has a punch when you need it and warm when you let up on it a little great job you should be proud of that instrument. While that makes five instruments I have gotten for people including my two I have now on this Island. I will keep you up-dated on the sound of Jimmy's guitar as it settles in in a few months. Sono Gaetano, come va? Qui tutto bene. La chitarra e molto bella, la tastiera e molto fluida e morbida. Davvero un capolavoro. Un grandissimo saluto. Gaetano, Italia, September 21, 2013. I received my guitar last week. She looks beautiful ! Next Thursday, I will be offering my first guitar concert. I wanted to share the news with you, because you were my first guitar teacher. I thank you for having given this opportunity to me. I thank you for helping me in persevering and for the love and outstanding education you had in store for me. I will cherish those years for the rest of my life... they were the happiest years of my life. If there's anything you'd like to share with me before the concert, please feel free to do so. A big Hug and thank you. Guitar received and she is indeed beautiful. Thank you very much! All I have to do now is improve my playing! I recieved her today! Very nice. The full cutaway is much easier to reach up. Feels real nice. The wood is awesome, you chose well, I really like the look, nice job! I believe you got everything just right! Erin is settling in nicely. The two woods really produce a fantastic sound. The Lord's Blessings. In trying to think of her name, I couldn't settle on any one, though Kim is simple and elegant. Her beauty is so natural and balanced. OMG the marquetry belongs in the Louvre when combined with that rosette. You are the MASTER of details in guitar production, like no one I've ever imagined. Kim is awesome, and I'm amazed that the volume is so high already, without the doble tapa. That Hauser bracing must really bring out her voice nicely. She's more than I expected, and yet exactly what I expected, since from you, from the very first email response you gave me, the response, tone, and artistry has always been divine in it's symmetry, more than I would have hoped for, and exactly what I needed at that time, therefore it's not surprising to see details like the marquetry reflecting the color scheme of my first Bellucci, but in a more grown-up, educated way, which would reflect my reasons for ordering her. Utterly superb. The closer I look, the more I see of God in your work, without losing the humanity of Renato. Thank you SO much. This Zorro motif is nothing short of absolutely beautiful and she is clearly a masterpiece just as you described. So I now have 4 Bellucci guitars, and I still get flabbergasted each time I open the case and see another beauty like this one sitting there. I am so happy with the mother of pearl decoration on the tuners, details on the bridge and rosette that I am simple overwhelmed. The African Blackwood B&S and African Rosewood simply look stunning together. She is a one of a kind and I appreciate this guitar from you very much. Thank you once again for such a wonderful guitar! You have completed her and made another gem of a guitar! She is astonishing and more that I could ask for. She came at my door the day before yesterday. I have let her rest and adjust to summertime Norway till yesterday evening. From the first moment I tuned her up and held her, I felt the significance and the impeccability that she represents. Absolutely astonishing looks and the sound from day 1, is so immense promising. I love the elevated fingerboard, it actually enhances the playability for my right hand in addition to increase vibration/volume. And the overtones that comes out of her at such an early stage is unimaginable. All in all, she is beyond words and reality. She is priceless. I can only thank you from my heart, for the dedication and work you put in to fulfill other musician's dreams. I started to teach myself to read and play 6 years ago. Where I live in South Africa near the famous Kruger National Park there are no guitar (music) teachers so it has been hard. since I stumbled onto Renato's website (through my love of Barrios ) what help and inspiration has entered my life! From the fantastic masterclasses to all the other help and wisdom one can glean from Renato's experience my confidence and ability and the way I think about my playing has improved in leaps and bounds. Now I am not alone on my quest. Thanks Renato! 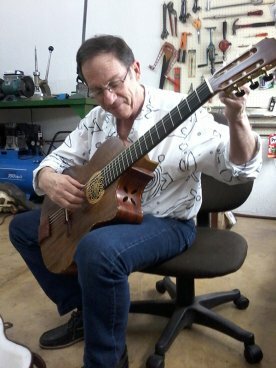 I was having my guitar lesson today, and am working on Barrios' Vals Op 8 No 4. Using your guitar, as I have been for the past few weeks (was using one of my other guitars for lessons prior to that, with 650 scale). But more often than not, I return to your guitar because it is such a good fit to my smaller hands (640 scale). I also love the radiused neck. My teacher looked at your guitar again, and he said he was really quite impressed. She looks so pretty and the sound has just gotten better over the past year as it has opened up. And he said I get a sweet sound with my delicate touch (I'll take a compliment when I can get it!). I do think playing guitar is not so very different than singing. And I love feeling the guitar, and how it resonates when I play big "fat" chords. It has a good home and is well loved. I do really enjoy the guitar, and wanted to tell you. Thanks so much for your good job.